Located in Lake Mary at the northern edge of the Markham Woods luxury corridor, this custom home community is divided to the east and west as you enter its gates. All of the homes here are custom-built on lots of one acre or larger. Building lots are still available and you may bring your own builder. Excellent restaurants and superb and varied shopping are conveniently located nearby in Colonial Town Center and Park Place. Interstate 4 is approximately 4 miles away giving residents easy access to downtown Orlando. 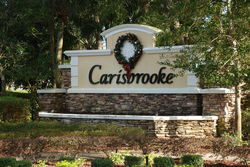 Contact us to tour this community or search our MLS to the left for your next home in the gated luxury community of Carrisbrooke !